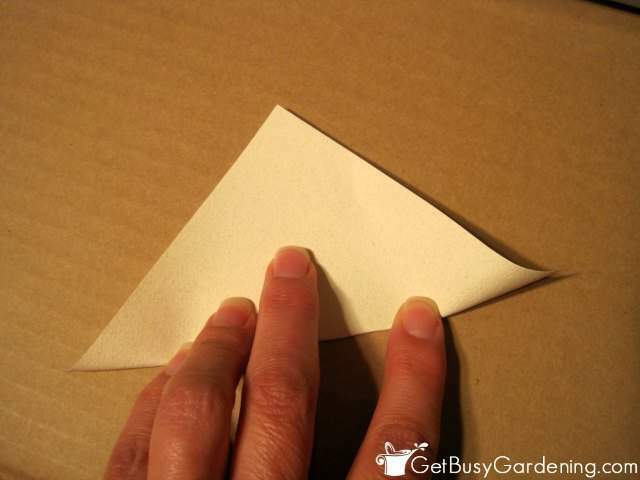 It’s super easy to make DIY seed envelopes out of paper! These small seed packets are perfect for sharing or trading the seeds you collect from your garden, or saving seeds for next year. 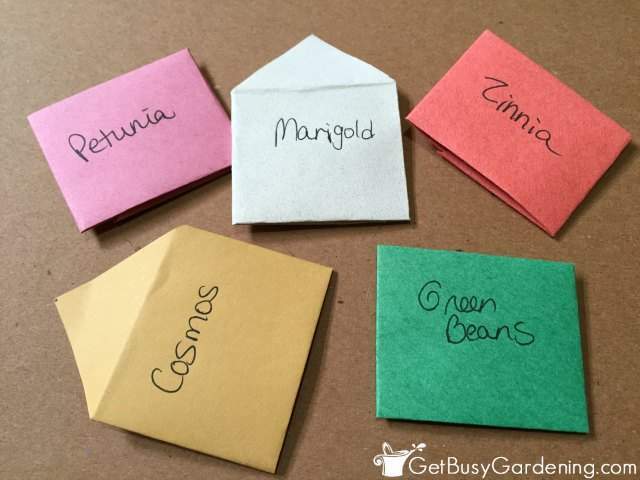 In this post, I will show you how to make your own seed packet envelopes, step-by-step. One of my favorite activities in the fall is collecting seeds from my garden. I use these seeds to grow my annuals and vegetables every year, which saves me tons of money. I also love to share seeds from my garden with friends, and use them to trade for other seeds. For sharing and trading, I like to make my own DIY seed envelopes. 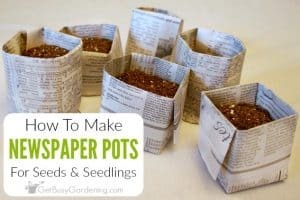 It’s super easy to make your own paper seed packets, and very inexpensive too! These instructions are for making 2″ x 2″ square envelopes (approximately), which work great for most types of seeds. They are easy to adapt to make your own custom size envelopes though. Simply cut the square bigger for larger envelopes (which would work better for bigger seeds). Or cut it smaller if you want tiny envelopes. Basically, as long as the paper is cut into a square, you can make any size seed packet you want. 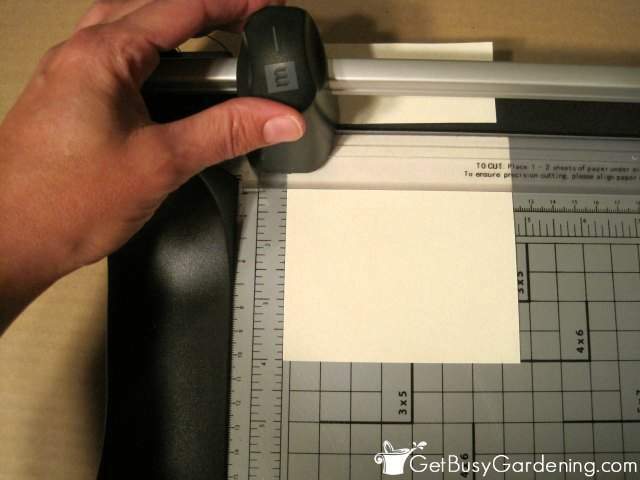 Step 1: Measure and cut the paper – Cut the paper into 4″ x 4″ squares. You could cut it with scissors of course. But if you plan to make a lot of these handmade envelopes (and you want them to be straight), I recommend using a paper cutter. That way you can cut several pieces at once too. 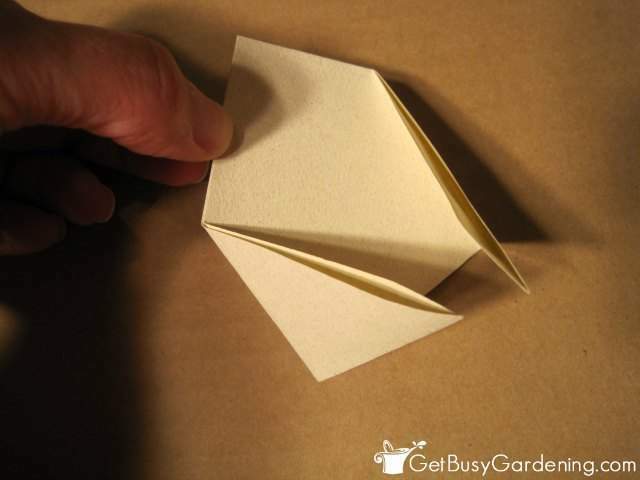 Step 2: Fold the paper square in half – First you want to fold the square of paper in half, corner to corner. Be sure to take your time lining it up so that the edges are straight. Step 3: Fold in the bottom corners to form the envelope – Fold the two bottom corners of the paper in so they overlap evenly. Be sure they align with the bottom of the envelope. Also make sure they are even on both sides so that your envelope is square. Step 4: Tuck in the flap to hold it in place – Tuck the corner of one flap into the fold of the other to securely hold it in place. The harder you make the creases, the tighter the hold of the envelope will be. Now comes the fun part… making your own custom seed envelopes! This is where you can get really creative, and design your own unique envelopes. You can make super fancy envelopes using stickers, stencils or stamps. Or simply write on your colored envelopes like I did. If you want to decorate them or you’re planning to write on plain envelopes, it’s much easier to do that before filling them. 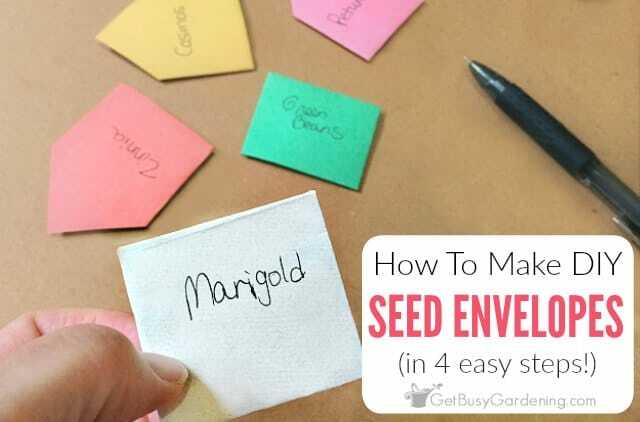 Write the name of the seeds on the front of the envelope using a pen, or get creative use fun markers. 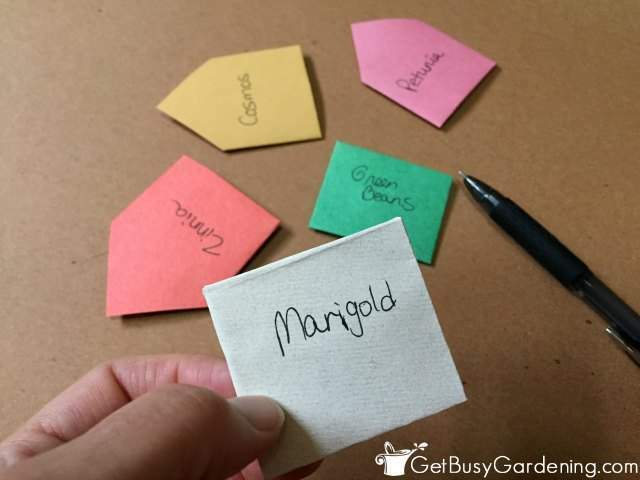 Or if you want your seed packets to look a bit more formal, use printable labels with your computer instead. Don’t forget to also include who the seeds are from, and the date they were collected. I like to write that information on the back of my paper seed envelopes to make it easier to read. Once you’re done labeling your seed packets (or decorating them if that’s what you want to do) then you can fill them with seeds. 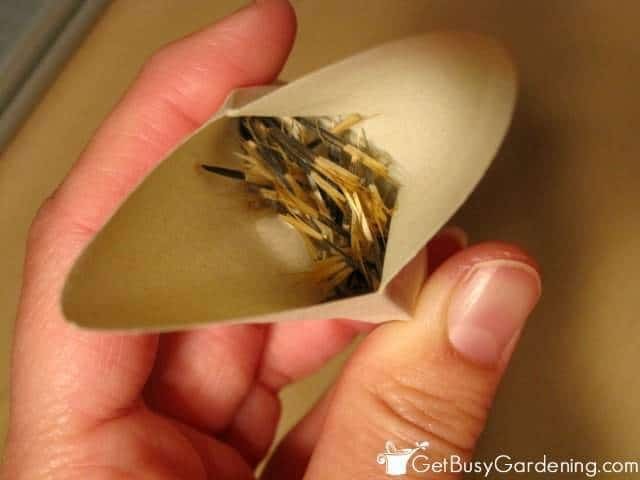 If the seeds are super tiny, then fold them into a small piece of paper or tissue before putting them into the envelope so they won’t leak out. 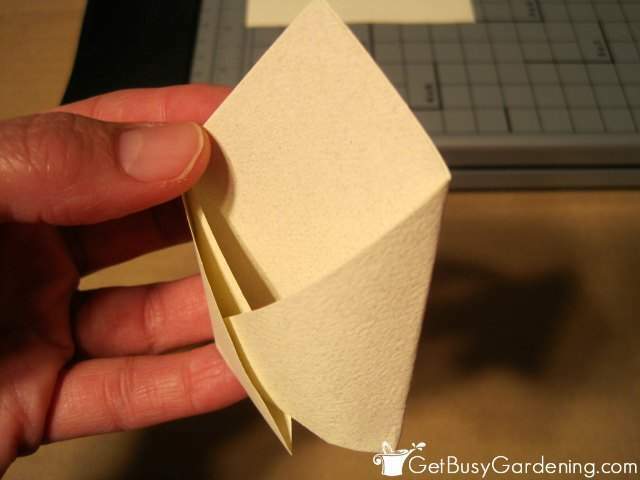 When you’re done filling your seed packets, simply fold down the top of the envelope to close it. You can either tuck it into the back of the envelope, or tape the flap shut. Use some decorative tape or a small sticker to seal your cute envelopes and dress them up a bit. You can these as gift envelopes for trading and sharing seeds with friends, or use them as personal seed storage envelopes! I like to keep my seed packets in a small plastic bin, like this one. I used to use a recipe box back when my seed collection was much smaller, and that worked great too! You could also use an old photo album to hold your seed envelopes (the type that has the pockets) if you have one of those. Otherwise you can get a Seed Keeper, which is specifically made for storing and organizing seed packet envelopes! 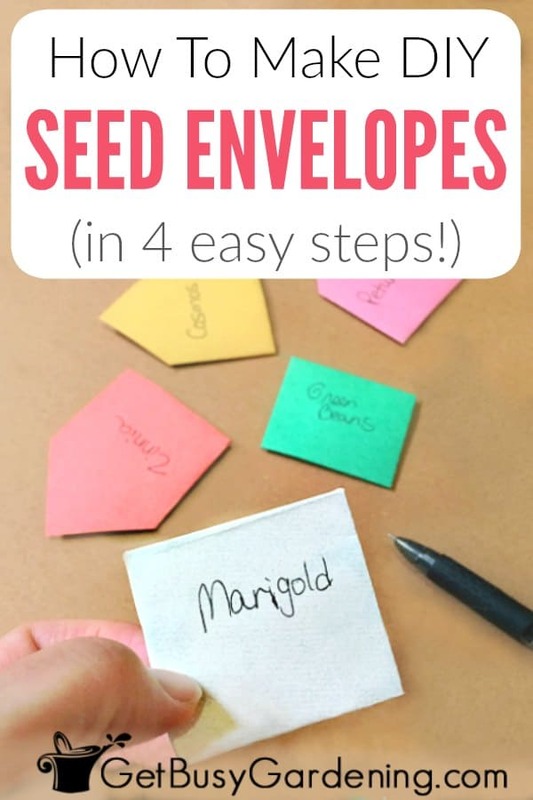 Don’t worry if you don’t have time to make your own seed envelopes, it’s pretty inexpensive to buy envelopes online. You can get these small brown envelopes for seeds, or even get them in other colors like blue or green! Basic coin envelopes also work great as seed saving envelopes. 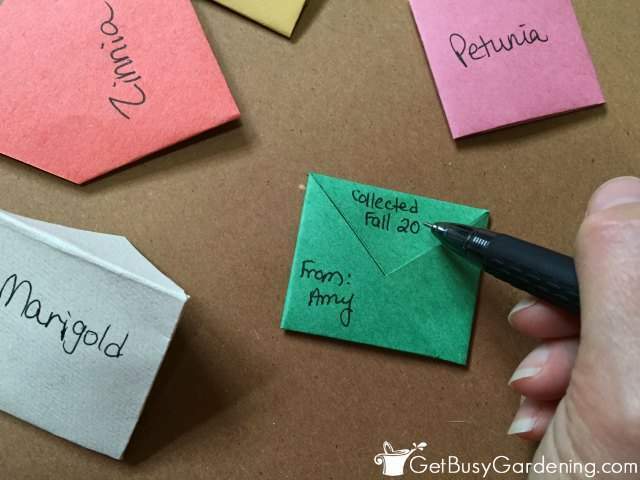 Making your own DIY seed envelopes is a good way to use up all kinds of scrap paper. Your friends and fellow seed traders will love the cute packets their seeds come in, and they can throw the envelope into the compost or recycling bin when they’re done planting the seeds. 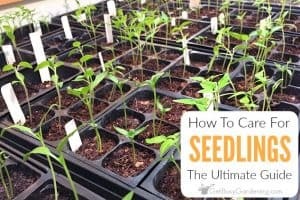 Do you want to learn how to start your seeds indoors? 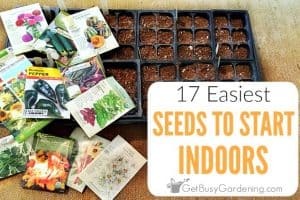 My Starting Seeds Indoors eBook is just what you need! 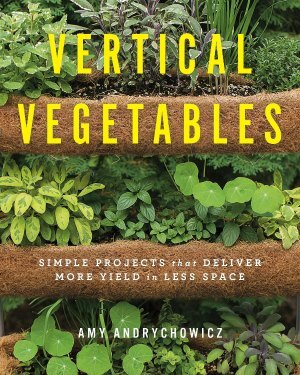 It’s a quick-start guide that will get you growing in no time! Download your copy today. 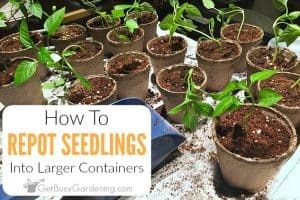 If you want to learn everything you need to know about growing all of your plants from seed, then enroll in the Online Seed Starting Course! 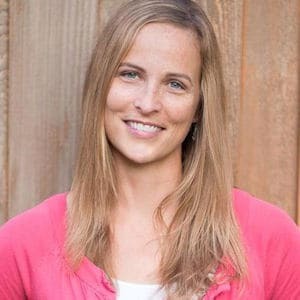 This comprehensive and fun course will guide you every step of the way! Share your steps for how to make seed packets, or your favorite types of seed envelopes in the comments section below! Thanks for the instructions…..I too love to collect and trade my seeds with others. Will do this easy crafty idea next seed season. You are so industrious, Amy! Thanks for the instructions! Haha, thanks! You're welcome. Hope you’ll make some envelopes for your seeds too! I often use old envelopes that come with bills, etc. What a great way to recycle envelopes! OHHHH I love this!! I was gifted a HUGE box of seed envelopes long ago and still, I’m not even close to finished it…but this is a great DIY for those who don’t want to purchase something like that! What cute little envelopes! I love this idea. Thank you, I’m glad you love them! I used to use a recipe box when my seed collection was much smaller, and that worked great. Here’s one that I like. Thank you for these instructions! I saved a ton of seeds from my garden this year and made all of my seed packets this way! When my Aunt saw what I was doing, I showed her how to make them too! You’re welcome, so glad you like my DIY seed envelopes! It’s such a fun way to share seeds with friends. Great idea thanks. I prefer to use paper rather than plastic bags because I see that small seeds can stick to the bag with ‘static electricity’ and that may not be good for them. Best wishes from New Zealand. The static in plastic bags is definitely annoying (especially for tiny seeds), but shouldn’t hurt the seeds at all. I guess you are right Amy. A lot of seeds get stored in Ziplok bags and they still seem to grow. I’ve just finished saving and storing my tomato seeds for this last season and they are all my DIY paper bags. Thanks again! Love this! The answer to my dilemma!! Have a women’s event coming up and want brand visibility in the 225 bags. This is now happily happening. Thank you.